Breakthroughs in and the exponential pace of disruptive innovation are fundamentally changing the way we do business. Brands and organizations are looking to digital transformation as the key to innovation, growth, and the discovery and creation of new business opportunities. Customer acquisition, the customer experience, and customer retention have become make or break stakes. 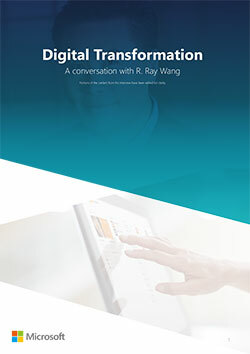 “For salespeople, the shift that’s happening is that you have access to better data and better information,” says Wang. “You can actually get to team and collaborative selling techniques that you weren’t able to get to before. “And over time, a lot of the selling that we were able to do by gut is happening in front of you in terms of insight. What digital does is it democratizes the ability to access information, and ultimately democratizes decisions and allows every sales rep to be productive. “We’re seeing a whole bunch of machine learning services evolve, and that means they study patterns to see why certain sales are more effective, or why certain techniques are more effective, or how certain products work with each other. “In transformation, post-sale engagement becomes extremely important,” notes Wang. “We are in a post-sale, on-demand, attention economy. What people don’t realize is that everything that comes after the sale is now more important than just the sale—because in an on-demand economy, instead of buying the whole thing, you’re accessing and not owning. “You’re buying smaller and smaller pieces of a product, service, or experience. So, customer service and customer success is really about all of those things that get a customer to come back and renew. “So we see customer service as not just that continuing engagement and customer success. It’s about developing loyalty and creating relevant engagement points so that people come back. It’s also about issue-to-resolution, which is the original point. But, it’s more than just the resolution. It’s about understanding what the customer really needs, driving a demand signal and helping people design new products and services. “You can do things that you couldn’t do before because you’re seeing things happen in real-time. And that changes not just how you service a customer and in terms of the brand perception, but it also changes the types of experiences and immediacy of experiences that you can deliver to customers. Plus, it changes the way you alter campaigns in the process, because you understand the impact of context in those campaigns.